1. One of Walt’s first art jobs was drawing cartoons for a local barber in exchange for haircuts. 2. In order to scrape together the money for a train ticket to Hollywood, Walt took pictures of babies in Kansas City, Missouri. 4. When Walt built the 1/8th scale Carolwood Pacific Railway in his backyard, he made his wife, Lillian, sign over the right of way through her flower garden. Their two daughters served as witnesses. 5. He’s most famous for voicing Mickey Mouse, but according to official Disney Archivist Dave Smith, Walt was also the voice of Ferdinand in the Academy Award-winning short Ferdinand the Bull. Disney has been responsible for many firsts in their long history, and has been falsely credited with others. Here are some of them. 8. The first feature-length animated film wasn’t actually Snow White and the Seven Dwarfs. (Walt himself admitted that it “was not the first feature-length cartoon by 20 years.”) Snow White wasn’t even Disney’s first. The first Disney animated “movie” was The Academy Award Review of Walt Disney Cartoons, a collection of several previously released shorts with new bridging narration that was released to build excitement for Snow White. The Academy of Motion Picture Arts and Sciences defines an Animated Feature Film as having a running time of “more than 40 minutes" [PDF]. The Academy Award Review came in at 41. 9. While Toy Story is often credited as the first 100 percent computer animated movie, Brazilian film buffs disagree; they claim the Brazilian movie Cassiopeia was first. Cassiopeia was released after Toy Story, but because Pixar had used clay models and scanned them in with lasers, not everything in Toy Story was 100 percent computer generated. Some consider this cheating. 10. While today the term "Imagineer" is associated with Disney, it was actually created by Alcoa in the 1940s. 000,000,000,000,000,000,000,000.16. If turned into solid gold, this amount would create a sphere 6 million light years in diameter—the same as 150,000 Kessel Runs. For what it’s worth, Forbes estimates Scrooge’s wealth at only $65.4 billion. 13. In 2014, the songwriter/keyboardist behind the band Nightwish, Tuomas Holopainen, released Music Inspired by the Life and Times of Scrooge, a concept album based on Don Rosa’s Eisner Award-winning comic book story detailing how Scrooge made his money. It reached the top of the charts in Finland. 14. In the original Disney comics, Scrooge’s nemesis, Flintheart Glomgold, was South African. DuckTales decided to make him much more Scottish, presumably because at the time apartheid was still law in South Africa. 15. One of the animals in the first hardback Disney book, The Adventures of Mickey Mouse (1931), was named Donald Duck. 16. Donald wouldn’t officially debut until three years later, in the short The Wise Little Hen. Because this was a Silly Symphony—the first color cartoons Disney produced—Donald was the first of the “Fab 5” (Mickey, Minnie, Donald, Goofy, and Pluto) to appear in color in a theatrically released short. 17. Donald’s nephews (Huey, Dewey, and Louie) first appeared in the comics, and then a few months later made their big screen debut. While the background of how they got to Donald are broadly similar, there are a couple big differences between the comic and the cartoon. In the comic, the boy’s mother is named Della, which turned into Dumbella for the cartoon. The bigger change is that Della was Donald’s cousin while Dumbella was his sister. 18. Huey, Dewey, and Louie actually have a fourth brother, Phooey. In the comics, sometimes the artist accidentally drew one too many nephews in a panel. 19. One of the most successful things to come out of Disneyland has to be Doritos. In the early days of Disneyland, Casa de Fritos was a restaurant that served Tex-Mex and was associated with Fritos (and later Frito-Lay). The story is that the restaurant was getting in a shipment of tortillas when the salesman advised that instead of tossing unused tortillas away, they should cut them up and fry them. This new dish became an instant hit. Later, when an executive of the newly formed Frito-Lay was looking around, he noticed how popular these fried tortilla chips were. Soon, Doritos were conquering supermarket shelves. 20. The drawbridge at Fantasyland can actually open, and has done so on two occasions: Once on opening day and again after a major park redesign in 1983. 21. During the 1983 renovation of Fantasyland, Disney brought back the original voice of Alice, Kathryn Beaumont, to do the voiceover work—more than 30 years after the movie came out. 22. Another major change was the addition of characters to Fantasyland rides. In the original Peter Pan’s Flight, there was no Peter Pan because guests were supposed to be Peter. But this was so confusing for guests who wanted to see the titular hero that a figure was added in the renovation. 23. The King Arthur Carrousel, which dates back to 1922 and was purchased from a Toronto amusement park, is one of the oldest attractions in Disneyland. But Walt wasn’t entirely pleased with what he bought—he wanted all of the horses to be jumping. Any standing horse had its legs broken and reset. 24. The oldest attraction in Disneyland is the Petrified Tree in Frontierland, which is believed to be about 55 to 70 million years old. Walt procured the relic from a privately owned petrified forest in Colorado. Sadly, the story of it being a present to Lillian is likely just that—a story. Walt probably intended it for a natural history exhibit, where he was planning to display rocks and minerals as well as sell Disney branded minerals. 25. On opening day, Disney didn’t yet have character costumes for the parade, so the company borrowed some from the Ice Capades, which did Disney-related shows. 26. Tony Curtis’s 40 Pounds of Trouble (1962) was the first non-Disney movie filmed at Disneyland. 27. On Partners (the famous statue of Walt and Mickey in several different parks), Walt has "STR" on his tie. This stands for Smoke Tree Ranch, where Walt used to have a vacation home. After Disneyland opened in 1955, every city in the world wanted one. Walt refused the offers, but he was continually thinking of where he could go next. 29. After the New Jersey failure, Disney decided to look into St. Louis for the “Riverfront Square” park (which was actually going to be entirely indoors). The company created blueprints and was ready to go until something happened and Disney canceled it in 1965. 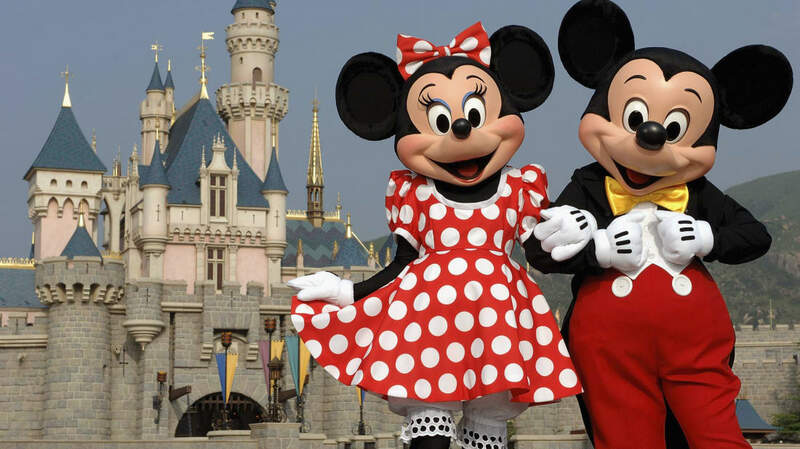 It’s unclear why the project didn’t go forward, but the most common explanation is that the Busch family insisted it sell beer, and Disney refused. Still, most Disney historians think that the beer issue had been worked out fairly quickly, and that the real cause was St. Louis’s refusal to help pay for construction. 30. The canceled St. Louis project might also have something to do with the fact that on November 15, 1965, Walt announced that he had purchased a huge area of land near Orlando, Florida. There were a couple of issues with buying the land in Florida, chief among them the mineral rights. Under American law, a land owner is allowed to separate out the surface rights from the mineral rights for the same plot of land and sell them separately. Tufts University used to own large areas of Central Florida, but retained the mineral rights when they sold the surface rights. This meant, in theory, they could come in and dig up any building in the area to get at underlying resources. Thankfully, Disney found this out and was able to negotiate a sale for $15,000. 31. In 1993, Disney announced Disney’s America, a new park in Virginia. The idea was basically a giant Frontierland that tracked American history from the Colonial Era through the Civil War and into World War II. Less than a year after the announcement, protests and concern about the proximity to the Manassas Battlefield (at only 3.5 miles away, the National Park Service was worried the site would be threatened by the development around the battlefield) forced the abandonment of the idea, with several of the elements moving to California Adventure when it opened in 2001, such as the whitewater raft ride (Grizzly River Run), Paradise Pier, and the original Condor Flats. 32. In the 1960s, the Mineral King area of the Sequoia National Forest was opened to private recreational development for a new ski resort. Walt Disney Enterprises decided to put in a bid, and won. They were going to build a destination that could be used for skiing in the winter and other outdoor pursuits in the summer. But soon after the announcement, environmentalists turned on the idea and lawsuits relating to the project went all the way to the Supreme Court. Eventually, the area was added to Sequoia National Park, ending all plans of development. Probably the most famous thing to come out of this was a show Disney had planned for the development called Country Bear Jamboree. 33. Albuquerque, New Mexico nearly got a Disney park as well. While Mineral King was being held up in courts, the Albuquerque Chamber of Commerce offered Sandia Peak to Disney, who seriously considered it. Ultimately, the company concluded that the weather wasn't right. 34. Any Disney fan can name the Disney Animated Classics (the feature-length animated movies), but a European and American would have different lists. In the U.K., The Wild is included as a classic, while Dinosaur isn’t. 35. All 10 of the highest grossing G movies are either Disney or Pixar, and of the top 15, only Gone With the Wind interrupts Disney’s streak. But not everyone appreciates the family friendliness of these movies; English children were required to bring a parent along to see Snow White because it was deemed too scary. 36. It’s actually kind of amazing that Snow White was created at all. Walt originally budgeted $250,000 for the movie (around $4 million today), but he knew that this was a wild understatement, later saying, “we were spending about that much on every three Symphonies.” Walt estimated that it ultimately cost around $2 million. 38. During the filming of Snow White, Walt was very clear that no matter how much was spent on the movie, if the final product wasn’t up to his standards, it would be destroyed. 39. It was a good gamble though, because Snow White became the then-highest grossing film of all time. Sadly, Disney’s next movie, Pinocchio, failed to do as well. Walt commented that it was actually the second highest grossing film of the year (after Gone With the Wind, which had been released in December of the previous year). But due to soaring costs ($3 million) and World War II removing most of their markets, Disney failed to recoup their investment in the original release. 40. Other Disney films from this time that failed to turn a profit on their initial releases included Sleeping Beauty, Alice in Wonderland, Bambi, and Fantasia. 41. Dumbo was set to appear on the cover of TIME in December of 1941. It was kicked off the cover following the attack on Pearl Harbor. 42. In 1994, Warner Bros. did test screenings of their new animated movie, Thumbelina.The audience reaction was so-so—but when they replaced the WB logo with Disney’s in test screenings, audience scores skyrocketed. 43. In the original Peter Pan, J. M. Barrie wrote that “[Captain Hook] has an iron hook instead of a right hand,” but in the cartoon, Captain Hook has the hook on his left hand. This was because the animators wanted him to be able to write and do other activities with his right hand. 44. Pluto was introduced in 1930 in The Chain Gang as a bloodhound. In The Picnic, he was introduced as Minnie's dog Rover, and then became Mickey's in 1931’s The Moose Hunt. 45. Disney’s first named animated character, Julius the Cat, appeared in 1924. The next year, Pete was introduced. Originally a bear in the Alice Comedies (a collection of cartoons that featured animated characters interacting with a live action girl), Pegleg Pete would go on to fight Oswald the Lucky Rabbit and then, after a species change, became a cat who first appeared as Mickey’s antagonist in Steamboat Willie. Ninety years after debuting, Pete is still one of Disney’s main villains. 46. Steamboat Willie premiered at New York's Colony Theater before the movie Gang War, a completely forgotten (and violent) mob movie. But that's not Gang War's only Disney connection: Some of the music for the movie was written by Al Sherman, father of the Sherman Brothers, who did the music for Mary Poppins and many other Disney projects. 47. Why was Mickey called Willie? The short version is that it’s a reference to Steamboat Bill, Jr., which was both a popular song and a recently released Buster Keaton movie (but Willie was not, as many people claim, a parody. There’s almost no connection between the two). Walt didn't call the film Steamboat Mickey because he felt that Mickey Mouse was an actor, not a character. In the same way that Bogart played the role of Rick in Casablanca, Mickey Mouse is playing the character of Steamboat Willie for the short. 48. For the first several decades of Mickey’s existence, his birthday was celebrated September 30, when the soundtrack for Steamboat Willie was recorded. It wasn’t until later that Steamboat Willie’s release date of November 18 was chosen as the character's birthday. 49. There’s a debate about when Mickey debuted. On May 15, 1928—six months before Steamboat Willie—Walt showed a then-silent Plane Crazy, which stars Mickey as a wannabe Charles Lindbergh, to a test audience in an attempt to get a distributor. He didn’t get one, so most Disney fans agree the real birthday is the wide release debut. 50. The animation of Plane Crazy was a remarkable feat in and of itself. Walt had just been robbed of his Oswald the Lucky Rabbit cartoons by his distributor, and many of his animators were about to leave with Oswald. But there were still three Oswald cartoons left on the Disney contract before most of the animators left. So while the soon-to-leave animators were finishing those up, Disney legend Ub Iwerks worked in secret (supposedly with Oswald drawings on hand if an unexpected visitor arrived) and single-handedly animated all of Plane Crazy in two weeks, producing 700 drawings a day. 51. Despite Mickey’s great success, Disney never made much money off of the cartoons. According to a 1934 article in The New York Times, one of the original Mickey Mouse cartoons only just came out of the red, about six years later. Even Three Little Pigs, which the same article says was “the most successful short subject produced by any studio,” grossed $64,000 (it cost $60,000 to make). From day one, Disney made most of its money from merchandising. 52. Donald may get all the nephew credit, but Mickey and Minnie each have nephews and nieces, respectively. Mickey’s nephews are Morty and Ferdie, and Minnie’s nieces are Millie and Melody. Daisy has nieces as well: April, May, and June. 54. Phil Simms was the first Super Bowl MVP to say, "I'm going to Disney World.” He was actually instructed to say Disney World and Disneyland three times each; he got $50,000 (and a free vacation) for his troubles. 55. "The Ballad of Davy Crockett," the theme song to the miniseries Davy Crockett: King of the Wild Frontier, was a huge hit, spending several weeks at number one on the Hit Parade and selling seven million copies in six months. But its origins are a bit more practical: It was written because the show was running short. 56. Davy Crockett mania reached such a fever pitch that one department store advertised that with every major appliance sold, they’d give away a free Davy Crockett play tent. They were inundated with orders and estimated they’d give away 35,000 tents during the promotion. 57. It’s a myth (albeit a pervasive one) that the name WALL•E is an homage to Walter Elias Disney. According to Pixar, “Nope. Sorr-e.” WALL•E just means Waste Allocation Load Lifter, Earth-Class.